RIVERSIDE, Calif., Sept. 11 2008/ -- Fleetwood Enterprises' RV Group, a leading producer of recreational vehicles, held its 2008 Top Dealer Award Ceremony during its National Dealer Meeting at the Paris Hotel and Convention Center in Las Vegas, Nev. on Wednesday, September 3, 2008. Fleetwood's Top Dealer awards are given to dealers who have sold the most units by brand in a 12-month period. This year, Fleetwood paid special tribute to those dealerships that were number one in the nation by brand, as well as number one overall for motor homes and travel trailers. 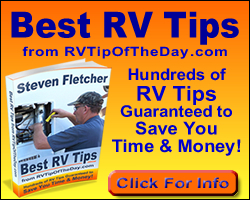 Fleetwood also recognized its "most improved" motor home and travel trailer dealers. "We have the best dealer network in the industry," said Paul Eskritt, president of Fleetwood's RV Group. "From the product development and planning stages to the delivery of the final product to the customer, our dealers are a crucial part of our success. The Top Dealer award is just one way we acknowledge their sales excellence and thank them for their ongoing support of Fleetwood." Mike Thompson's RV Super Stores, Santa Fe Springs, Calif.
Freedom Roads, LLC, Lincolnshire, Ill.
Driftwood's Atlantic RV Center, Egg Harbor Township, N.J.
American Coach - Lazydays RV SuperCenter, Seffner, Fla.
American Heritage - Lazydays RV SuperCenter, Seffner, Fla.
American Eagle - Lazydays RV SuperCenter, Seffner, Fla.
American Tradition - Lazydays RV SuperCenter, Seffner, Fla.
Revolution LE - Lazydays RV SuperCenter, Seffner, Fla.
Excursion - Lazydays RV SuperCenter, Seffner, Fla.
Providence - Niel's Motor Homes, North Hills, Calif. Discovery - Lazydays RV SuperCenter, Seffner, Fla.
Bounder Diesel - Lazydays RV SuperCenter, Seffner, Fla.
Expedition - Niel's Motor Homes, North Hills, Calif.
Pace Arrow - Lazydays RV SuperCenter, Seffner, Fla.
Southwind - Niel's Motor Homes, North Hills, Calif.
Bounder - Lazydays RV SuperCenter, Seffner, Fla.
Fiesta - Mike Thompson's RV, Santa Fe Springs, Calif.
Terra - Giant RV, Montclair, Calif.
Tioga - Mike Thompson's RV Super Center, Santa Fe Springs, Calif.
Jamboree - Giant RV, Montclair, Calif. Rental - El Monte RV, El Monte, Calif.
GearBox - Mike Thompson's RV Super Stores, Santa Fe Springs, Calif.
Nitrous - Mike Thompson's RV Super Stores, Colton, Calif.
RedLine - Mike Thompson's RV Super Stores, Colton, Calif.
Quantum - Walker RV Center, Oklahoma City, Okla.
Regal - Lazydays RV SuperCenter, Seffner, Fla.